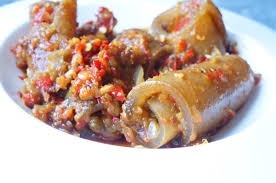 Pomo delicacy - (Google Photo). Pomo meat is under threat and the Nigerian government is to blame. You have heard as they say in some quarters that Nigeria is eating its leather industry. The government seems to be buying into the argument. It is taking steps to increase leather production which could be sad news to lovers of the rolled up delicacy. The Minister of Science and Technology, Ogbonnaya Onu, said this while speaking on the federal government’s plans to make Nigeria a leather hub to drive industrialisation. Onu spoke on Thursday in Abuja at the matriculation of trainees and inauguration of Nigerian Institute of Leather Science and Technology (NILEST). “By doing this, we will also strengthen our capacity to convert our rich agricultural products into viable economic goods and services that we need for both domestic consumption as well as strengthen export earnings. “This will help in job and wealth creation, help restore national self-reliance and self-confidence, enhance prosperity and boost our economy,” the minister said.